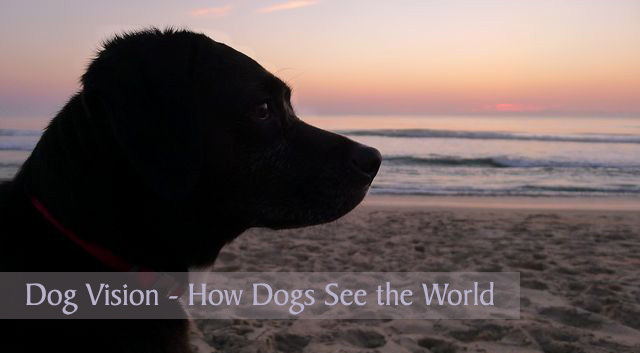 Have you ever thought about how dogs see the world? I’ve often wondered why Haley doesn’t seem to notice our resident chipmunk sitting on the edge of the porch during the day, even when I try to point him out to her. Yet, she’ll let me know that she sees something up ahead while we’re walking through our wooded neighborhood late at night. It always scares me a little bit when she alerts me to something lurking in the dark and I’m unable to see right away that it’s only a meandering cat or deer. Yes, our dogs definitely see the world differently than we do. People used to think dogs were color-blind, but research has shown that dogs do see some colors, just not as many as we humans see. Here’s a quick refresher from science class to help explain why. Humans and dogs both have photoreceptor cells called rods and cones in the retina of their eyes. Rods are more sensitive to changes in light and in detecting shapes and movement, but rods are not sensitive to color. Rods help us see when it’s dark but we’re basically color-blind in low-light conditions. Cones are better at detecting color and creating fine detail; it’s what we rely on in daylight to view all those amazing shades of color. Hang in there with me, all this scientific talk gets more interesting when you compare the rods and cones of the human eye to that of a dog’s eye. We humans have three types of cones that are sensitive to the colors red, blue and green whereas dogs have only two types and they mostly see the colors yellow, blue and various shades of gray. The image below helps illustrate the comparison mapping of the color ranges. Humans have 6 million cone cells compared to the 1.2 million that dogs have. We can see about a million different shades of color and all those colors help distinguish fine details in our surroundings. Dogs can only see about 10,000 different shades of color and far less detail because of their low number of cones. When it comes to comparing the number of rods, it’s a different story. Although it’s not known how many rods dogs have compared to our 120 million, we do know that a dog’s eye is about five times more sensitive to light, so perhaps they have five times more rods than we humans have. What Colors Can My Dog See? Researchers are pretty sure this is how dogs see color: Dogs don’t see shades of red or green. Reds appear to be dark gray to black. Orange, yellow and green appear to be different shades of yellow. Blue and violet colors appear as different shades of blue to blue-gray. Click on the picture below to view how your dog would likely see the image. Notice the difference in colors as well as the lack of detail dogs have. The green, red and orange toys tend to blend in with the grass but the blue toys are much easier to see. Click on the image to view what your dog sees. Practical things to consider about how your dog sees color. If dogs see grass as yellow, how well will your dog be able to find a yellow ball in the grass when playing fetch? He might have to rely more on his sense of smell to find the ball, but a blue-colored ball would stand out well against a sea of yellow grass. It’s common to see agility equipment painted in combinations of blue and yellow or red and white to help dogs better recognize the obstacles. 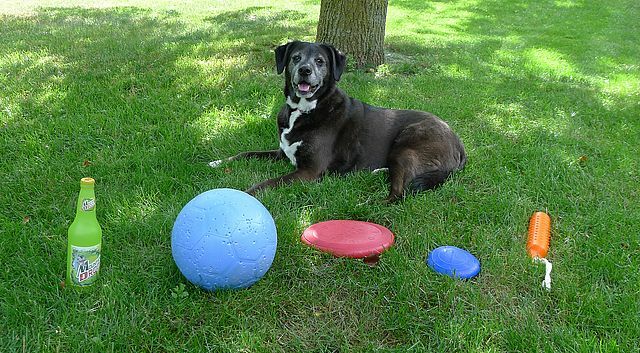 If you’re constructing your own backyard agility equipment for training, you might want to consider how color can affect your pup’s success or reluctance to train with a particular piece of equipment. Orange hunting dog bumpers, like the one shown above, would appear as a shade of yellow in grassy areas and might be challenging for young hunting dogs to locate. But perhaps the orange bumper would be appropriate for advanced training. I’ve never tried agility with Haley and have never owned hunting dogs, so I’m hoping some of you experts will weigh in with your opinions on those last two points. Another difference in how dogs see the world is they don’t have sharp distance vision. They are nearsighted to varying degrees but on average their vision is about 20/75 which is much worse than a typical human’s vision acuity. This could explain why your dog might not seem to recognize you or other family members at a distance. You appear as an outline of a figure until your dog approaches closer or perhaps he picks up your scent or recognizes your unique body movements. This is something to keep in mind when working on recall at a distance; some trainers even suggest using arm movements along with the recall command. 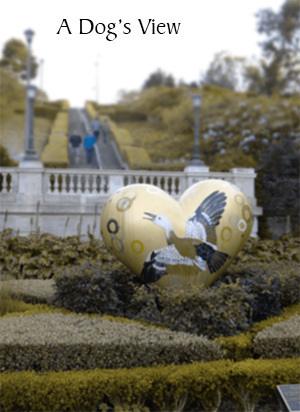 Check out the two images below to compare how your vision acuity likely compares to that of your dog’s vision acuity. If you’re starting to feel sorry for your dog, don’t worry. In some ways, your dog’s vision outperforms your own. Remember those rods? 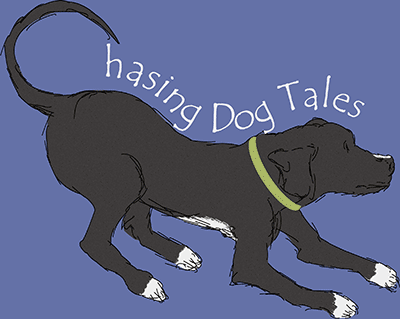 They play a big role in how dogs are able to see and hunt prey at night. Here are three amazing qualities about a dog’s eye. Dogs are 10-20 times better at detecting movement in the distance than humans. That probably explains why Haley sometimes barks at things across the street when she’s looking out the front window. Sometimes I have to really study the landscape before I notice a small animal moving in the distance. That chipmunk she doesn’t notice sitting on the porch is in for quite a surprise once he starts moving. Game on, Mr. Chipmunk! Having so many motion-sensitive rods is probably why dogs also love it when you animate their toys. Dogs see better at night than we do. The extra rods, larger pupils and something called a tapetum (which we humans don’t have) combine to provide for exceptional night vision, especially around the prime hunting hours of dawn and dusk. Their larger pupils let in more light and the tapetum, a membrane that acts as a reflective mirror, bounces light waves back at the retina a second time allowing it to take in more light. Light reflecting off the tapetum is responsible for that glow in an animal’s eyes at night or in photos when a flash is used. Humans don’t necessarily see better than dogs, we just see differently. Even though we see more colors, details and have better distance vision, a dog’s sense of sight was designed to be efficient for hunting, especially at night. If you feel bad that your dog doesn’t see as well as you, remember that dogs primarily “see” the world through their sense of smell. I’m sure our dogs would feel sorry for us if they knew how much we’re missing by not having the ability to experience so many varied aromas. Have you noticed anything unique about your dog’s vision or how he sees the world? Mom always feels bad we don’t see the vibrant colors like she does, but the more she works with us on our scent work, the more she realizes we don’t care because we have other senses that are so strong, actually she is probably missing out on more things in life than we are. Absolutely! I always think of dogs seeing the world through their noses first. You’ll have to let me know if you notice the Doodles playing with certain colors of toys more. Thanks for sharing the post, Cathy. This was interesting!!! Thanks for the great read! So interesting seeing the colour differences side by side like that. I thought they saw a lot less colour than that. Yes, the studies are really fascinating. I’m hoping we’ll learn more with future research! Delilah sees the chipmunk when he sits out on our deck, I wonder if that is because she can see the shape of him and knows the landscape and knows that nothing should be where he sits? Lol, just think of all the money you could save by not coloring your hair. 😉 You’ll have to send Delilah to our house to teach Haley a thing or two about chipmunk spotting! Mr. N’s trainer showed us an app that shows us how dogs see the world color-wise. The colors look a lot more muddy lol. I bet before too long researchers will be able to know exactly what dogs see. I’m also hoping one day to know what Haley dreams about…maybe, lol! On top of this difference, Jack’s eyesight is starting to go…and his hearing too – I sometimes have to jump up and down and wave my arms to get him to see me at dusk. Aw, I’m sorry Jack’s eyesight and hearing aren’t what they used to be. He did a great job though of finding those treats in your video. That’s interesting, Jackie. Haley sometimes does that too if she’s at the other end of the house when I come home. She’ll stop about 25 feet away and bark until I say something. She sounds ferocious, but she’s such a chicken! Wow – very interesting and informative! I always wondered what colours dogs could see and now I know! Great post! Thanks, Meghan! Yes, you could be onto something there, lol! awesome post, pinned and tweeted. I liked the picture you could click on. Gambler can see orange from a mile away if there is a orange bumper way out in the field he can see it just like if there is a stick marking a blind with orange tape on it he goes right to it. Thank you so much for sharing the post, JoAnn. Gambler’s vision sounds amazing. I think certain breeds have evolved to have better distance vision than others and it certainly benefits hunting dogs in the field. I see now why my dog relies more on his nose than his eyes when searching for his toys. Love the pictures that show how dogs see the world. That’s interesting about the orange bumpers, from the picture it looks like blue would be a better choice. I’m hoping one day soon we’ll know a lot more about their vision, the research is really interesting though. Thanks for stopping by today, Anne! That is so true, Cathy! Nothing gets by their noses, right? Thanks so much for stopping by and also for sharing the post! I always thought it was clever that the people who sell the ball flinging tool for dogs colored their balls blue and orange. Blue so the dogs can see it and orange so their people can. Fascinating post. You provide a great service here. Thanks for visiting my blog. I hope you have fun with the acrylics. They can be messy – but that can be fun too. And you can always paint over a mistake – very hard to do with watercolor or pencils.